(AFP) – Violence against Egypt’s Coptic Orthodox Christian minority, one of the largest and oldest groups of Christians in the Middle East, has escalated at an alarming rate in the last several weeks, with little official response. Since late May, Christians in Egypt have been the victims of at least a dozen sectarian attacks, and activists and politicians say the government has done little to stop it, despite Egyptian President Abdel-Fattah el-Sisi’s early overtures to the Coptic community and their staunch support of him. “It is escalating in a very short time,” said Mina Thabet, programme director for minorities and vulnerable groups with the Egyptian Commission of Rights and Freedoms. 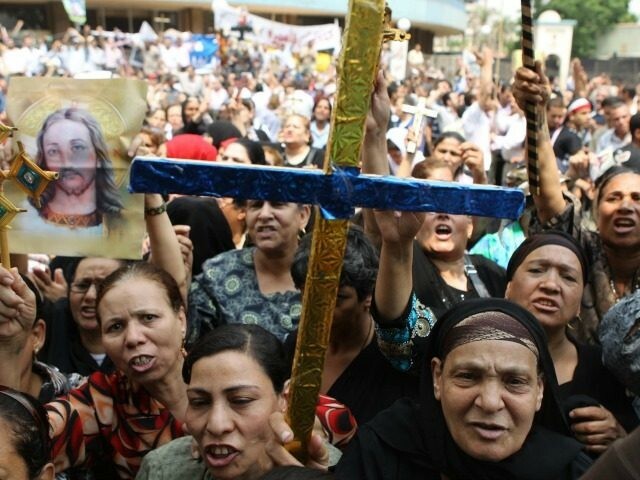 Among the assaults was one in late May on an elderly Coptic woman in Minya, who was stripped, beaten and paraded naked because of a rumour that her son was having a relationship with a Muslim woman. Seven homes in the town were set ablaze. Victims said the police response was late and insufficient. Sectarian tensions heated up even more on June 30, three years to the day after the beginning of the protests that led to the overthrow of Egypt’s first democratically elected president, Mohammed Morsi, when a Coptic priest was gunned down in Al Arish, North Sinai in an attack claimed by the IS group. The group accused the priest of “waging a war against Islam”. As gruesome as that attack was, the majority of the incidents have not taken place in the IS stronghold in northern Sinai, but in the Governorate of Minya, which is nestled along the Nile river about 250 kilometres south of Cairo. Minya has the highest concentration of Christians in Egypt, with some estimates as high as 50 percent of the population there. There are no reliable statistics about the Christian community in Egypt, but they are widely believed to make up about 10 percent of the country’s overall population. Hours before the priest in Al Arish was shot, the under-construction house of a Coptic man in Minya was torched by a mob who thought he was building a church – despite his having signed an affidavit in the presence of police, the mayor and the local sheikh saying the structure would be a residence and would be used for no other purpose. The four adjacent homes, which belonged to his brothers, were also burned. The building of churches is a flashpoint for sectarian tensions in Egypt. Per capita, there are far fewer churches serving the Christian community than there are mosques serving the Muslim community, and the building of new churches is strictly restricted under Egyptian law and requires special permissions. Christians for decades have had difficulty obtaining the necessary approvals and often face fierce opposition from Muslim neighbors. While the recent violence has been concentrated in and around Minya, other Christian strongholds in the country have suffered as well. For example, an attack occurred on July 2 in the governorate of Sohag, which is about 500km south of Cairo and also has a large Christian population, when the teenage daughter of a priest was grabbed from behind by the hair and stabbed in the neck in what appeared to be a failed attempt to slit her throat. She was rescued by a bystander and survived the attack. And on July 9 in Tanta, a town 90km north of Cairo that also has a sizable Coptic population, a pharmacist was stabbed to death and beheaded. His body was found in a house across the street from his own. According to Egyptian media reports, he was lured there by a request for a medicine delivery. The reports also said the house is owned by Salafists, members of an ultra-conservative sect of Islam. The clashes flared up again in Minya later that week when homes of five Copts were looted and torched on July 15 after a rumour that a building that served as a kindergarten was being turned into a church. Security forces were notified as soon as the attacks began but didn’t arrive until an hour later. The fire engine that responded to the scene had no water. Two days later, on July 17, the cousin of a priest in Minya was fatally stabbed in the heart and three others injured after a dispute that started outside the priest’s home. While clashes occur throughout Egypt, Minya has been an area of particular concern, both historically and of late. It was the first spot where violence erupted after Sisi’s speech on July 3, 2013 in which he announced the overthrow of President Morsi, who hearkened from the ranks of the Muslim Brotherhood and whose followers blamed Christians, at least in part, for his ouster. Minya also has high, if not the highest, rates of ransom kidnappings of Christians, which occur sporadically throughout the country. Many factors contribute to the recent escalation of violence in Minya, Thabet said. Radical Islamists have long had a strong, deeply rooted presence in the governorate and control schools and therefore the dissemination of ideology. That isn’t helped by an illiteracy rate that approaches 40 percent, nor the fact that about 30 percent of the poorest villages in Upper Egypt, the rural south of the country, are there. But perhaps the biggest problem, according to activists, is the lack of prosecution. In none of the recent cases were the perpetrators given anything more than a slap on the wrist, points out Sherif Azer, Egyptian civil rights activist and PhD researcher at the University of York, UK. Traditionally, instead of filing criminal charges, local authorities pressure Christians into “reconciliation” sessions, in which the opposing parties come together to negotiate a settlement outside of the criminal justice system. Copts are often pressured into surrendering their legal rights and sometimes even forced to leave their communities. The Egyptian Initiative for Personal Rights (EIPR) issued a statement earlier this week in which it called the reconciliation process “an instrument that only serves to perpetuate tensions and create a climate in which any dispute between citizens is liable to escalate into sectarian violence and collective punishment”. Instead, activists and politicians say they would like to see the law applied in cases of sectarian violence. Member of Parliament Haitham El-Hariri was cited in The Daily News Egypt newspaper saying that reconciliation session are unconstitutional and illegal. “The law should be applied on any violators, without arresting innocent people just for the sake of making balanced cases,” the article said he commented on Facebook. The Coptic Bishop of Minya, Bishop Makarios, agrees. He urged the victims of the attacks to resist reconciliation because it often leads to perpetrators escaping without punishment. He instead is pushing for the incidents to be handled by the legal system. In the incident of the elderly woman in Minya, she was pushed into reconciliation. According to some news reports, the eight defendants were eventually fined 10,000 Egyptian pounds each (slightly more than 1,000 euros) and released. In the case of the June 30 house burnings in Minya, several people were arrested, but no charges have been reported. The young man who tried to slit the neck of the teenage girl has been placed under psychiatric evaluation. Two men covered in blood were caught on surveillance video leaving the house where the pharmacist was beheaded, but according to most media reports no arrests have been made. In the July 15 incident, about 15 people were arrested, a mix of Christians and Muslims. According to media reports, the Muslims were released in time for the Ramadan meal; the Christians were detained longer and charged with minor offences. Five suspects were detained in connection with the stabbing at the priest’s home; it is unclear if charges have yet been filed. Even when Christians refuse reconciliation, few crimes against Copts go to trial and those that do are often dismissed because of a claimed lack of evidence, according to Ishak Ibrahim, researcher of religious freedoms at EIPR. “This sends a message that there is no equality, and no matter what you do and how you break the law you will not be punished,” he told Egyptian newspaper Mada Masr. The frustration was evident when Bishop Makarios sent a tweet “reminding” President Sisi that Copts are Egyptian citizens and the diocese of Minya “falls within the country’s jurisdiction”. A first step toward calming tensions would be to loosen restrictions on church building, activists say. But without the imposition of the rule of law, little will change. “What happened in Minya is nothing but a natural result of not enforcing the law in previous sectarian attacks against the Copts, and forcing the Copts to go through reconciliation meetings and obey illegal solutions that are demeaning,” Ibrahim said.